The unique circuitry of the 750 Series II Conductivity Monitor/controllers guarantees accurate and reliable measurements. Drift-free performance is assured by "field proven" electronics, including automatic DC offset compensation and highly accurate drive voltage. Since temperature compensation is at the heart of accurate water measurement, all Myron L® Monitor/controllers feature a highly refined and precise TC circuit. This feature perfectly matches the water temperature coefficient as it changes. All models corrected to 25°C. The TC may be disabled to conform with USP requirements. Built-in electronic calibration allows for fast quality checks without standard solutions. (Note: for maximum system accuracy standard solutions are recommended). Standard on all controller models is a heavy-duty 10 amp output relay, operating on either increasing or decreasing readings. Bright green/red LEDs indicate above or below setpoint readings. All 750 Series II models feature an IP65/ NEMA 4X water resistant and corrosion-proof rated enclosure. Compact in size at 152 x 122 mm/6 x 4.8 in., they are suitable for panel, bench or surface mounting. Additional options include a 3 Sensor Input Switch and/or a 3 Range Switch and a Remote Alarm™ model RA. These reliable sensors feature an integral temperature sensor to ensure accurate and rapid automatic temperature compensation. The sturdy polypropylene bushing is modular for easy inexpensive replacement. Several alternatives for the metal portion of the sensor are available, depending on the demands of the application. CS51LC sensors (0.1 constant) are used for 5 and below. 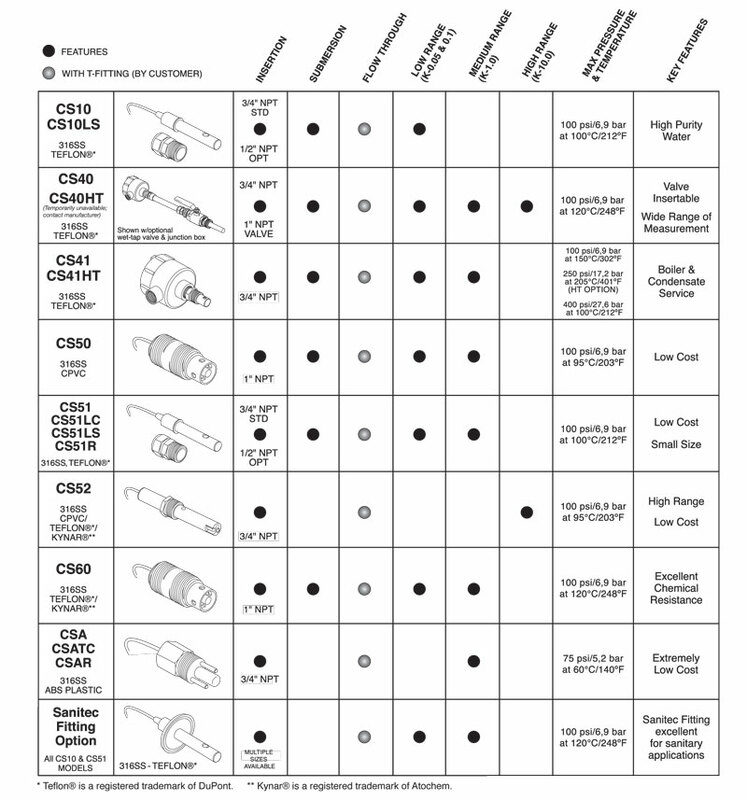 CS51 sensors (1.0 constant) are used between 0-10 and 0-20,000. CS52 sensors (10.0 constant) are used above 20,000. Low cost, low temperature, low pressure sensors available upon request. See 750II Sensor Selection Guide. Temperature Compensation: Integral thermistors provide automatic TC to 25°C between 0-100°C/32-212°F. Pressure /Temperature Limits: CS51: 100 psi / 690 kPa @ 100°C/212°F. 250 psig @ 205°C, Models CS40 and CS41 sensors available on special order. Bushing: Modular Polypropylene threaded 3/4" NPT. 1/2" PVDF or 316 stainless steel fittings available as option. Cable: Shielded 10 ft./3 meters standard 25 and 100 ft./ 8 and 30 meter lengths available. 100 ft./30 meter is maximum recommended. Dimensions: CS51: Metal portion 30 L x 13 Dia. mm/ 1.2 L x .5 Dia. in. All Myron L® Monitor/controllers have a Two (2) Year Limited Warranty. pH Sensors have a Six (6) Month Limited Warranty. If any Monitor/controller fails to function normally, return the unit to the factory prepaid. If, in the opinion of the factory, failure was due to materials or workmanship, repair or replacement will be made without charge. A reasonable service charge will be made for diagnosis or repairs due to normal wear, abuse or tampering. Warranty is limited to the repair or replacement of Monitor/controller only. The Myron L® Company assumes no other responsibility or liability.